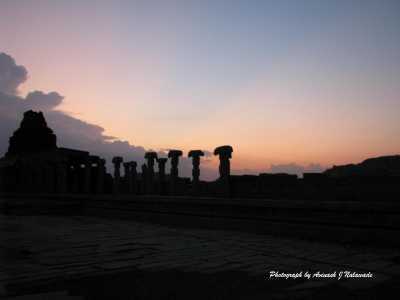 Hampi is one of the India’s best historical tourist destination. Hampi was used to be known as the capital of Vijayanagar, one of the greatest Hindu empires in India’s History. Now, Hampi is located in Bellary District, Karnataka. The other places to see while visiting Hampi is Virupaksha temple, Vithala temple, King’s balance and Lotus Mahal. In 1336 A.D. Saint Vidyaranya established the seat of Viayanagara Empire, with the help of his devotee disciples Hakka and Bukka. Afterwards the empire became famous for its support towards renovation/reconstruction of temples through out India. It also became famous for re-establishment of Indian culture, its support for music and art and literature. This empire stretched physically covering Karnataka, Andhra and Maharashtra and became a by-word for golden rule, with the prime purpose of caring for the people and their welfare. Hampi festival has been celebrated from the times of the Vijayanagar reign. Hampi festival, also known as the Vijaya Utsav. This Utsav has been reiterated as the “Nada Utsava” by the Government of Karnataka. This festival is held from third November to fifth November every year and is attributes to the mega cultural extravaganza. Hampi is World Heritage Site and is international tourist spot too. Popular artists of all over India come forward in bringing the grandiose days of the Vijayanagar period to the present day. The rich culture of Kannadigas in the field of music, dance and art thus showcased complement the beautifully carved ruins of Hampi. Bright colored handicrafts and leather puppets created by the traditional craftsmen of the past are reproduced with the same skill by their present generation. It vibrates the air with past grandeur when musical instruments such as pipes and drums traditionally played. To attract people all over the world to this magnificent land the Government of Karnataka promotes this festival every year. The main attractions are Men dressed in the military fashion of the golden era , decorated elephants and horses are posted underneath the red, yellow, blue and white cloth “Gopuras” are posted along the lanes of Hampi. The two kilometer path which was known as the Raja Marga near the Virupaaksha temple has been decorated as the Vijayanagar theme , the purpose behind this is to reveal the world to know by recreating that most world famous open trade in diamonds, gems and gold of the Golden Era used to be done here . To entertain the guest’s classical dance exponents and classical vocalists are set with their brilliant performances in five avenues. The other attractions are Janapada Kalavahini, Jumbo Savari, Light and sound show and even more. Hampi is located in Bellary District, Karnataka. Ideal time to visit here is October to March. By Air : Bellary is nearest airport, 74km from the city of Hampi. By Train : Nearest railway station is situated at nearby Hospet, which is well connected to and from Bangalore, Bellary, Gadag, Bijapur and Hubli-Dharwar. By Road : Hospet is well linked by bus services, which is 350km from Bangalore and also you can even hire a cab and can travel from bangalore to hampi and can enjoy your tour.